Tokyo is full of gardens. Yes, there are the formal kind surrounding temples and shrines, but there are also the smaller, everyday gardens tucked in just about every corner of the city. They come in all shapes and sizes with varying levels of complexity. There are so many, in fact, that it is rare to see a home, business, or even public location without some sort of plant or greenery. I first saw this garden last year, and since it's on one of my regular routes I watch its progress through the year. 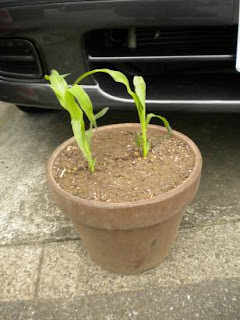 What makes this one unique is the small line-up of pots in front of the carport that are full of vegetables. 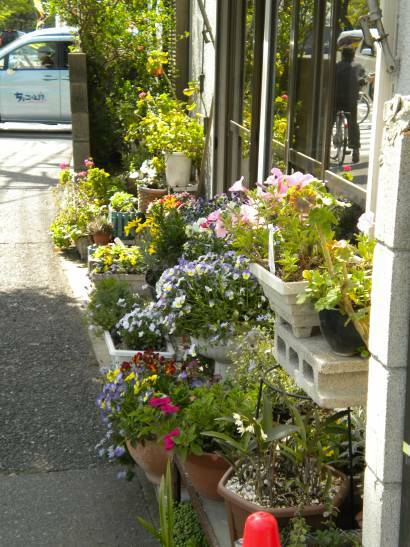 Usually, these gardens contain flowers and sometimes herbs such as shiso or sansho, but not vegetables. Here there was an eggplant (blown over during the gusty day), two tiny corn plants (adorable! 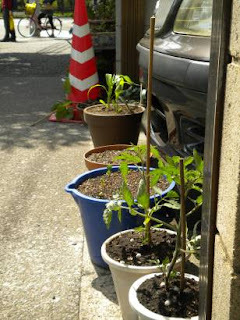 ), tomatoes, and some seedlings not showing their true leaves yet. The pots look a bit small for these guys, but I love the optimism they represent. 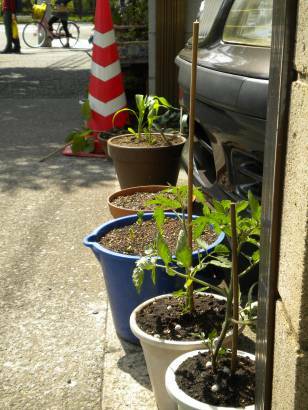 This is a hot, dry corner of an intersection busy with foot, car and bike traffic (hence the traffic cone at the corner of the carport), but I'm betting the gardener that lives here doesn't see or hear any of that when they tend those pots. It's just dirt, vegetables, and them, and I would also bet, a great deal of affection for those little sprouts. That's faulous! I just wrote an article on gardening in the city and how it can improve one's mood and impart a more positive outlook. You're right, seeing all those potted plants does make you feel optomistic, doesn't it? Oh, I'd love to read that article! I think it's so very true. Plus, I feel like it's simply part of the culture and tradition here to grow in containers intensively around your home. It's one of my favorite things about Japan.